The kitchen operates as the heart of the home and a space where we can cook and enjoy food while socialising with friends and family. With it being such a popular part of your home, it only makes sense that you want to keep the space looking fresh. Here is a little run through of the top kitchen trends that have come out of 2018. In the past, your home would likely have looked something like this: you’d have the sitting room where you would relax and enjoy some home entertainment, the living room where you’d gather to eat food and catch up with friends and family, and the kitchen which was solely used for cooking. Not anymore, thanks to the concept of liveable kitchens. What this means is that kitchens have become arguably the most sociable area of the home, with guests gathering in the kitchen to chat and enjoy a laugh while the host cooks up some culinary delights. Ensure you get on board the liveable kitchen trend by adding an elegant dining table or breakfast island into your kitchen and then finishing off the look with a collection of comfy chairs. 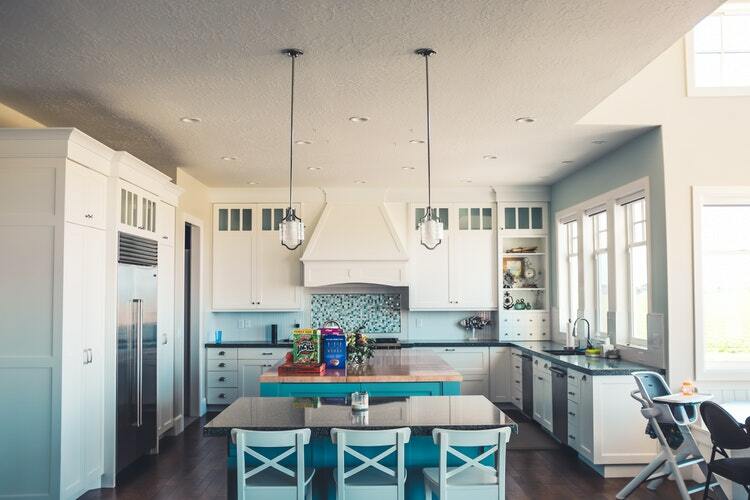 As more people gather in your kitchen during social gatherings, the minimalist trend is becoming more popular in this part of the house as homeowners look to make their spaces as smart and tidy as possible. Adapting to this trend is simple, as you just need to think about some smart storage solutions. Create space in one of your kitchen cupboards or cabinets, then use this to store your kettles, toasters and any other small kitchen appliance when they aren’t being used. The reduction of clutter around your kitchen counters will help the space look a lot tidier instantly. On the topic of all things smart in the kitchen, technology has come on so much in recent years and is now helping to take the stress away from your cooking space. The increasing availability of smart home devices — like Amazon Echo and Google Home with their automated, voice-activated features — is moving the smart kitchen trend forward in rapid fashion. 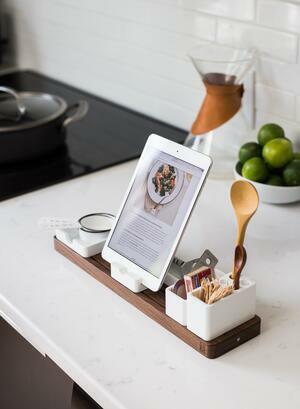 Expect to see more of these gadgets popping up around people’s kitchens, as they help people to go through recipes hands-free, order supplies on the go and control lighting simply through the power of speech. Want to help your tech-savvy friends and family out a bit? Then also consider investing in kitchen counter tops which can automatically charge electronic devices and thus ensure someone’s smartphone doesn’t suddenly run out of battery when they are in your home socialising. Moving onto the look of your kitchen, one design trend that is set to be popular for 2018 is a mix of light and dark tones. What we mean here is that if you opt to have your kitchen walls and cabinetry decorated in light tones — think white or cream — then you should create a balance in the room by having the floor etched in a darker hue, such as an ebony wood effect. It’s a big deal in the interior design scene when Dulux and Pantone announce their colours of the year. Dulux gathers a global panel of experts working in a variety of design industries, who then spend a year and a half discovering emerging trends to settle on a colour. Meanwhile, Pantone’s pick sets trends in interior design as well as fashion, furniture and many other areas for the year to come. 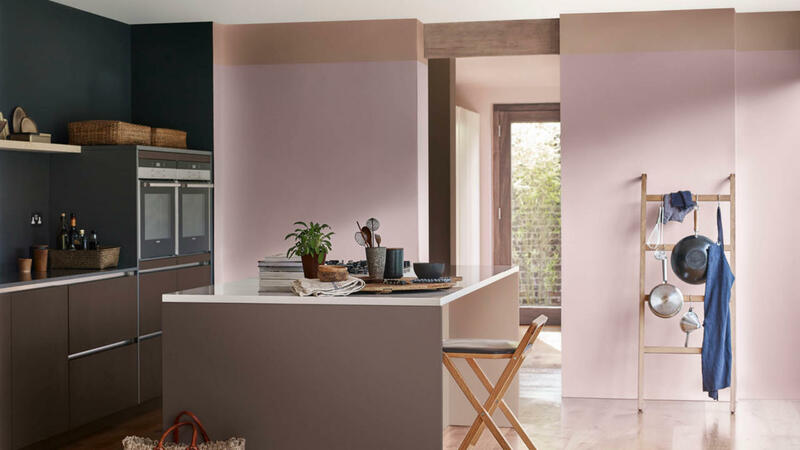 For 2018, Dulux has selected the dusky mauve mixed with smoke taupe tone of Heart Wood as its colour of the year and Pantone has opted for the dramatically provocative and thoughtful purple shade of Ultra Violet. “Heart Wood is a very versatile shade that grounds all of this year’s trend palettes, working with a variety of shades across the spectrum but all with a slightly muted quality. “To me, it really suits being combined with similar hues such as cocoa, like Woven Willow, and blush pinks, like Blossom Tree. This comforting hue also connects beautifully with desirable blues which continue to grow in popularity to off-set its warmth, especially rich inky tones like Sapphire Salute." Aim to work both colours into your kitchen in the months ahead, perhaps by choosing tiles or accessories in these tones. Copper has become one of the most popular materials in our interior designs recently, thanks in part to it being incredibly versatile. Highly polished, fiery and shiny styles can look just as appealing as those in muted and matt designs. Copper is certainly in demand and although trends come and go, its appeal shows no signs of slowing down any time soon. 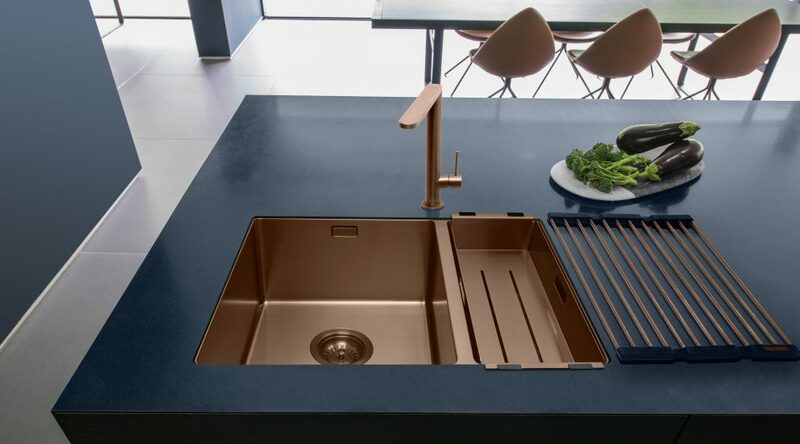 Working with suppliers such as Caple, allows us to include fitted copper finishing such as taps, sinks and cooker hobs built into your dream kitchen design. 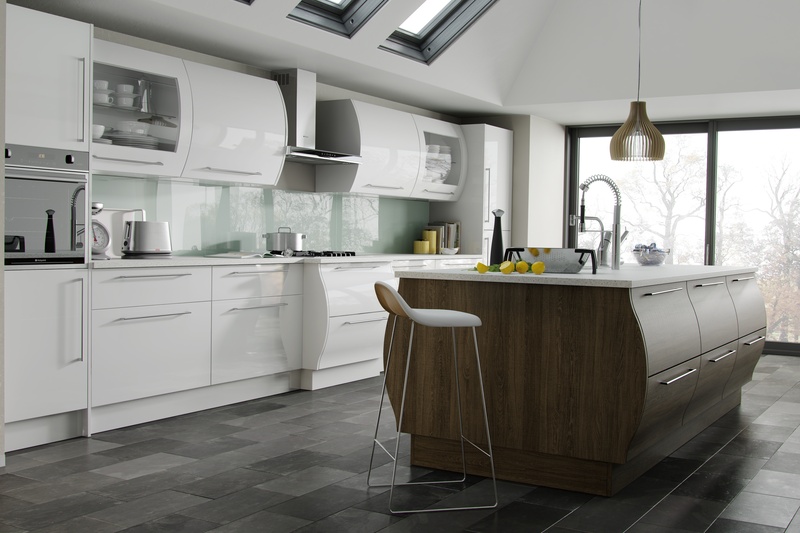 Are you a fan of the wood look in your kitchen but not keen on a full kitchen covered in it? Then don’t worry, as this trend uses a combination of textured wood and smooth finishings. A type of wood that catches the eye thanks to its grainy texture which is achieved through long, narrow burrows and cavities, pecky cypress styles can be applied to everything from your cooker hood to your breakfast island to great effect. For a more modern look, a wooden deck on your island is a nice touch. 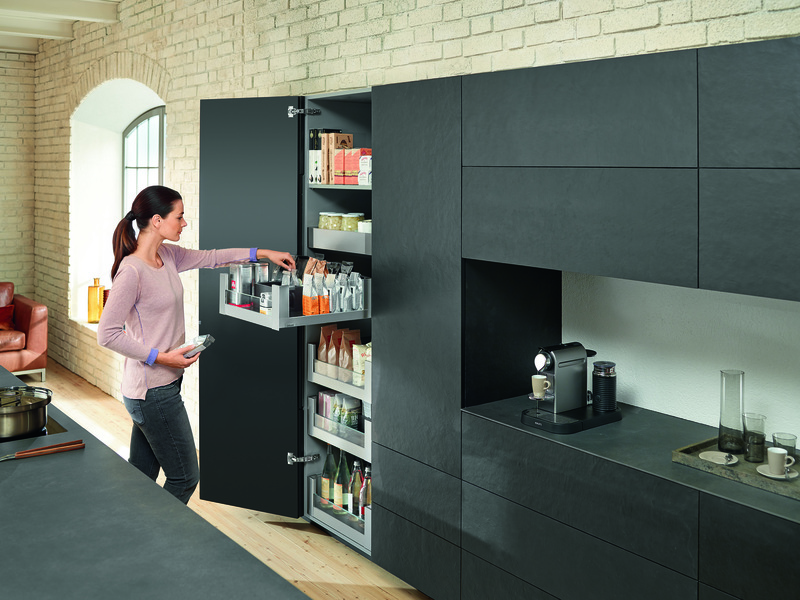 A very popular trend is the gloss cupboards with wood finishings. You can find more tips on adding texture to your kitchen here. Read our ultimate guide to kitchen design here for more tips. By now, you should have plenty of inspiration to create a kitchen to be proud of in 2019. However, why not head across to our kitchen design page for expert guidance and advice before starting your home improvements. If you are ready to start your dream kitchen book a consultation below and one of our friendly designers will come over and help you visualise your new kitchen with a free, no obligation design service and quotation.